use your hands | I'm Gonna Cook That! People, it’s been an interesting week. And by interesting, I mean, I’m glad it’s over and next week needs to be less interesting. But, if we’re going to think about the positives of the week, the fact that I had a healthy lunch, in fact, one of my favorite healthy lunches/snacks is at the top of the list. I’m going to show it to you, and show you how to do make it, and your mind is going to be blown by how completely lazy I am easy this is to make for yourself. 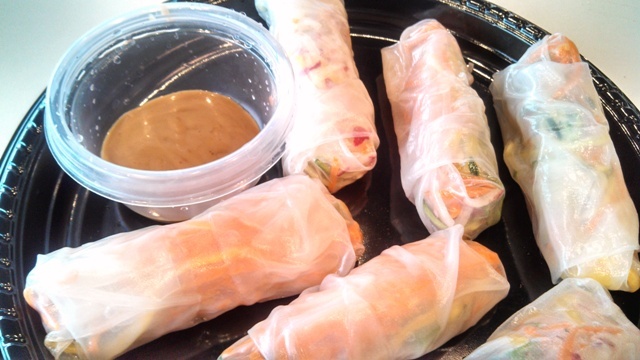 Dude, it’s spring rolls. It’s non-complicated. 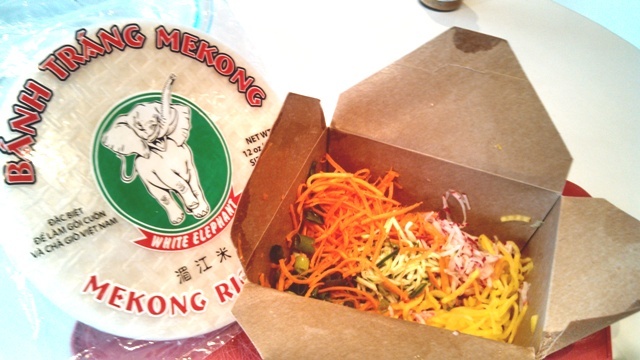 It’s go to the store, buy some rice paper, hit the salad bar for the assemblage of shredded vegetables of your choice, and buy a bottle of peanut sauce. I’m not even going to list out all the ingredients and the equipment because it’s your hands and a bowl. YOUR HANDS AND A BOWL. Lookit. You buy a package of rice paper wrappers. They’re in the Asian aisle of nearly every grocery store with more than 6 aisles. They’re like, $2 or less a package, and you’re going to get more than you need for one lunch in that package, which means you can make spring rolls over and over again. Grab yourself a bottle of peanut sauce, or tamari, or soy sauce, or fancy mango chili blah blah blah. Whatever kind of sauce you like will probably be delicious, so just get some. Then, you walk over to the salad bar and check out the shredded veggies. Do you want to stand at your kitchen counter shredding things? Do you have the time/motivation to make perfect juliennes? No, you really don’t. Not when someone at the grocery store is already paid to do that for you with a machine. Get some random combination of shredded vegetable matter and go to the check out. You’re done shopping. No really, you’re done shopping. Ok, maybe grab some of those Reese’s cups, but that’s it. Now you’re really done. So, you went there. You got those things. Go home. Fill up a bowl with some hot water. 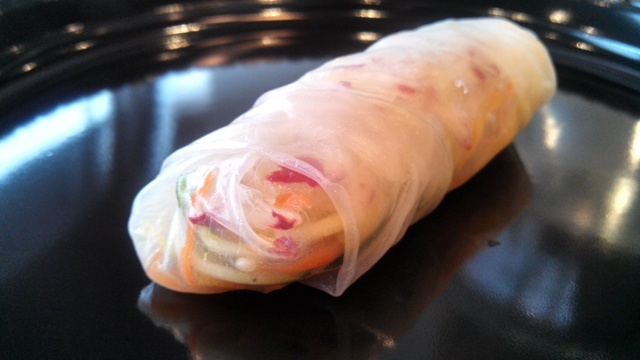 Dunk a rice paper wrapper in the hot water until it becomes all flimsy and soft. Lay it on a cutting board or your counter or a plate or whatever, put some of your shredded veggies on there towards the bottom third, roll it up like a burrito. Here, this will help. I’ll give you a minute to watch. Make another one. Then another one. Now you have a whole plate full. Pour your sauce into a little cup and put it on the plate with all those delicious, healthy, beautiful spring rolls. Put it in your face. Eat it. It’s delicious. It took longer to explain it than it will to do it, I promise. These are good for all summer, especially if you’re getting bored of salads. I know vegetables is vegetables, but make them look interesting. Put some thought into it instead of just dumping that bag of mixed leaves on a plate and drowning it in ranch. You can do this. I have faith in you.